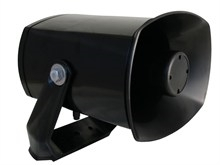 25W Ex plastic horn speaker.This versatile model can be ordered with different transformers for more tappings and power ratings. DSP-15 EExmN(T) is light and has M20 entries in the back lid for easy cable mounting. Extra termination space for loop in loop out purpose as standard. Now also with certificate for USA and Canada.